Obituary – Stickney, Sandra Kay (Shaffer) « Perry High School Alumni Association, Inc.
Mrs. Roger (Sandra K. Shaffer) Stickney, 17-year-old Perry girl was found dead on a hillside Tuesday morning at a Pomona, Calif. housing development site by a brick mason, 25 miles west of her home at Corona. An autopsy disclosed she died from multiple stab wounds made by a knife in the throat and chest. 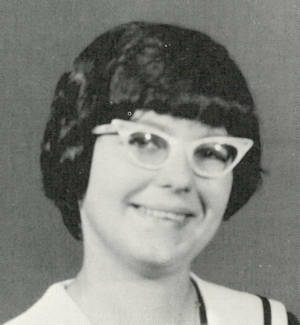 Mrs. Stickney, the daughter of Mr. and Mrs. Ray Shaffer, was born July 18, 1950, in Fairview. She attended Perry schools, and completed her sophomore year before enrolling as a junior at Perry high school last fall. She and Roger L. Stickney, 1965 graduate of Perry high school and son of Mr. and Mrs. Loy Stickney, were married Dec. 26, in Newton, Kan. They left Perry together for California only a month ago, where he was serving as a lance corporal in the Marine Corps stationed at San Diego, Calif. Survivors other than the husband include her parents, Mr. and Mrs. Ray Shaffer, route 4, Perry; a sister, Mrs. David Malget, Perry; a brother, David Shaffer, Newton, Kan.; and paternal grandmother, Mrs. Gladys Shaffer, Perry; and her maternal grandparents, Mr. and Mrs. Al Troyer, of Newton, Kan.
Funeral will be at 2 p.m. Monday in the Newton chapel. The services will be in charge of Rev. Fred R. Belk, pastor of the First Presbyterian church, with burial in Grace hill cemetery.